2019 starts out really big! 2019 is looking up. About four stories up! Back at my undisclosed location, the much anticipated backdrop sky mural took shape. 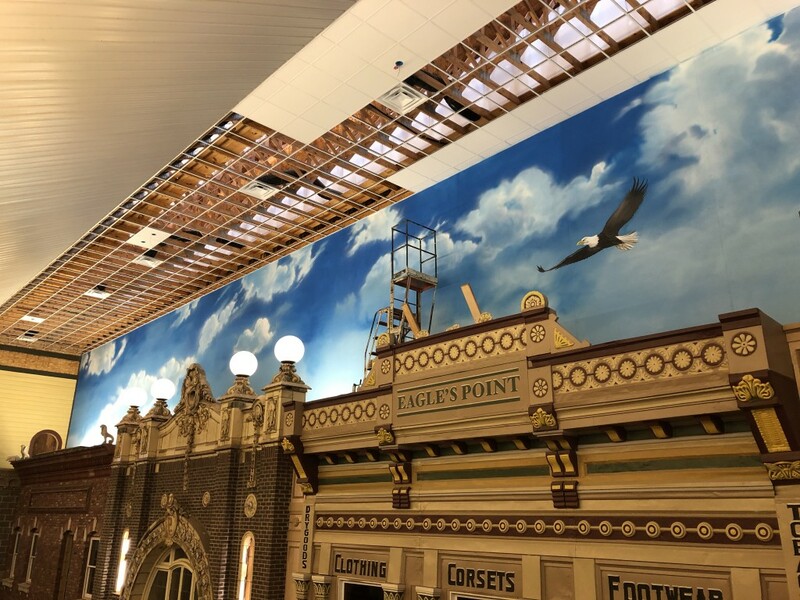 We always knew eventually I would create a sky to highlight the historical buildings. Now was the time. We began with 100 yards of heavyweight canvas rolled a faded blue on the floor. It was then stretched and applied to the 126’ long wall. This was easier than hanging the canvas first and then painting it. Things go slower when you’re that high up! 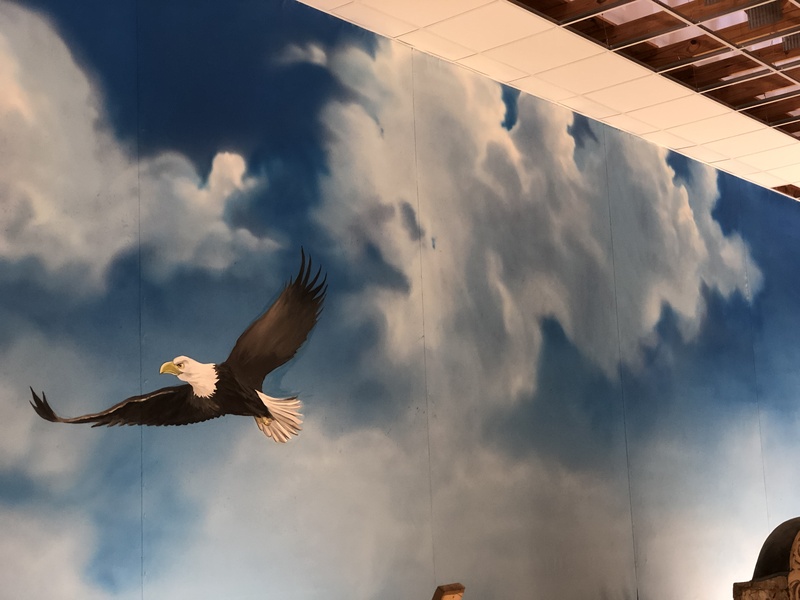 Once the wall was covered the hydraulic lift took me and my air gun up to the ceiling where I proceeded to paint a dramatic and carefree blue sky mural. 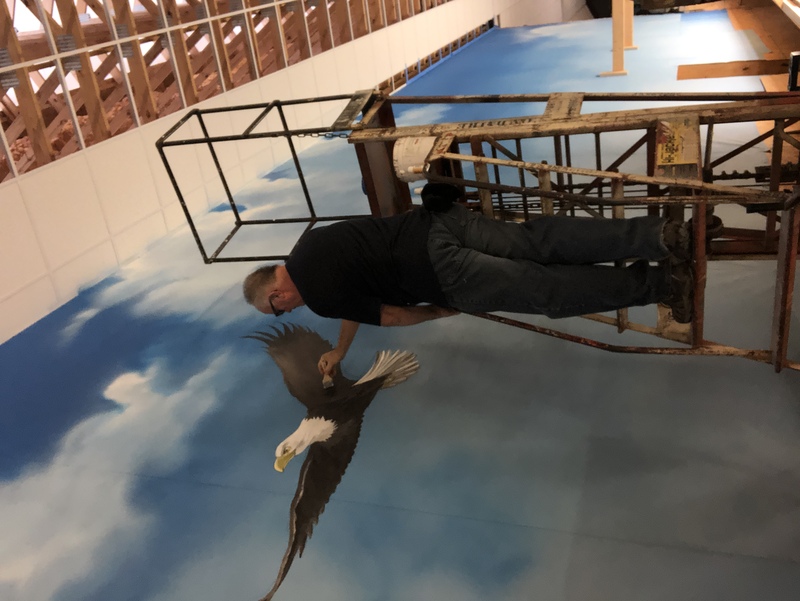 Eleven gallons of paint, 100 yards of canvas, four and one half stories in the air, twelve days and one eagle later it is finished. Mark Twain, Huck, Tom and Ray. Wait, what? 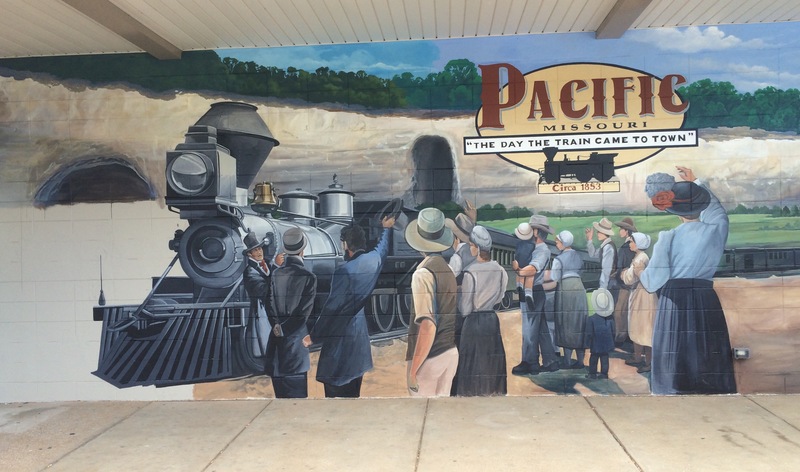 This week was the creation of a historical mural. 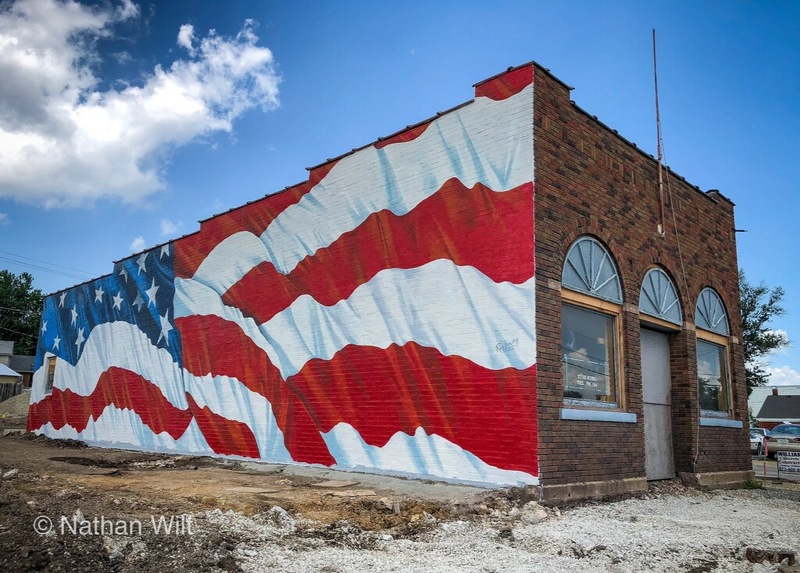 Hannibal, MO was given a new sixty foot wide American flag to celebrate July 4th for years to come. 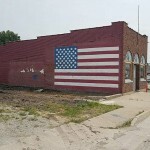 I was contacted only a month ago from a businessman who was renovating a century old building on Market Street. It was once a bank before the depression, then a post office and then local businesses. After 9/11 a small flag was painted on the west side which became very popular with the community. It has remained for eighteen years. 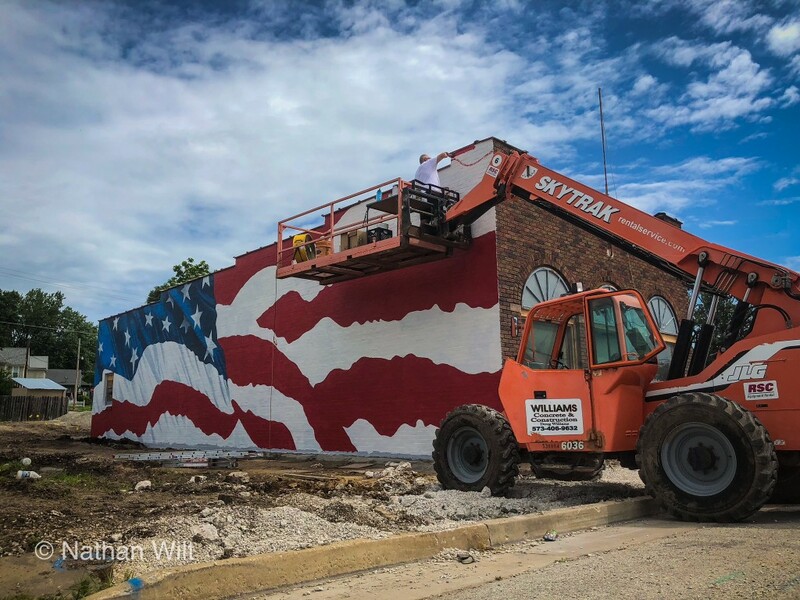 I arrived in Hannibal last Thursday in the hopes of completing the mural by July 4th. The rain held off for the most part but the heat was intense. Beginning work at 6am and continuing till noon and then again in the evening I persevered. 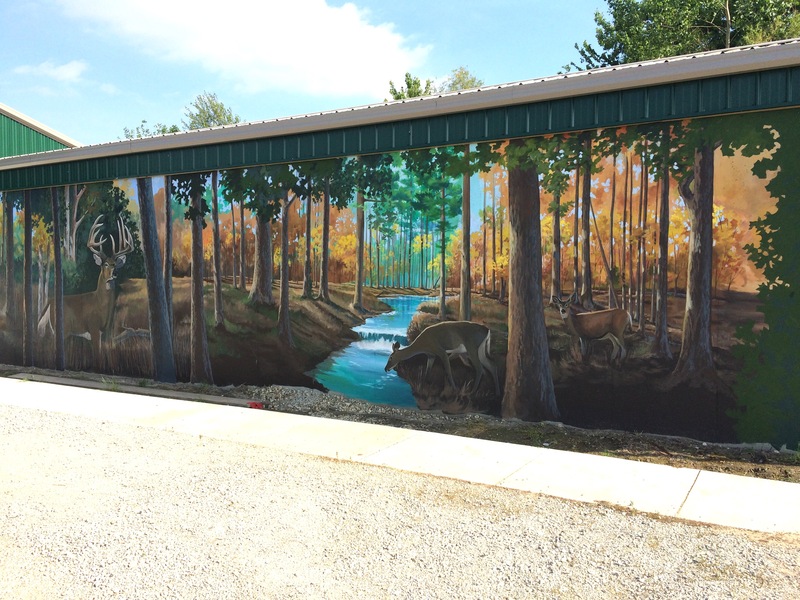 With the help of Brad, Doug’s hydraulic lift and Nathan Wilts support and help the mural was completed at 10am July 3rd. The entire painting took around 45 hours to complete. In that time many well-wishers, honks, waves and visits accompanied my journey. 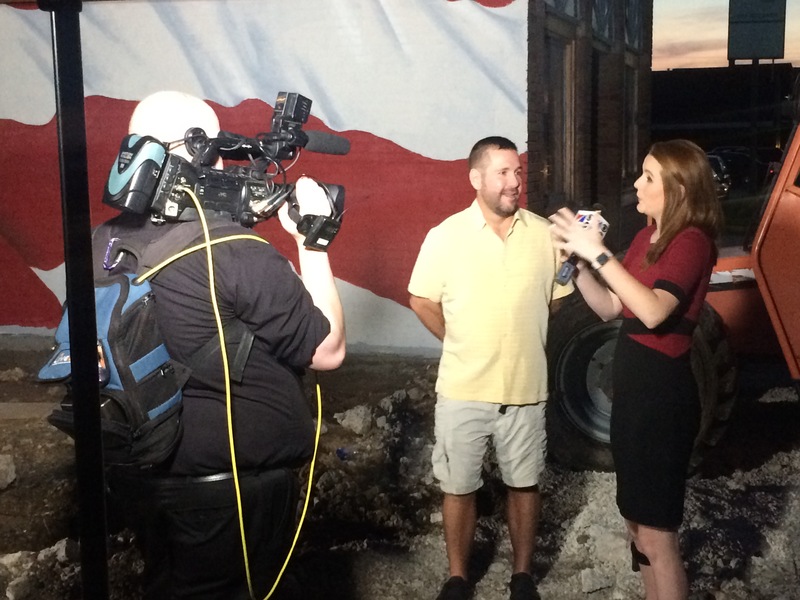 Many interviews with print and TV media were sprinkled through those 45 hours. 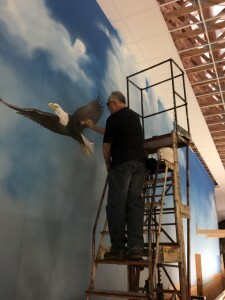 Yesterday the lift was moved and the mural was signed. It’s one of my proudest paintings! 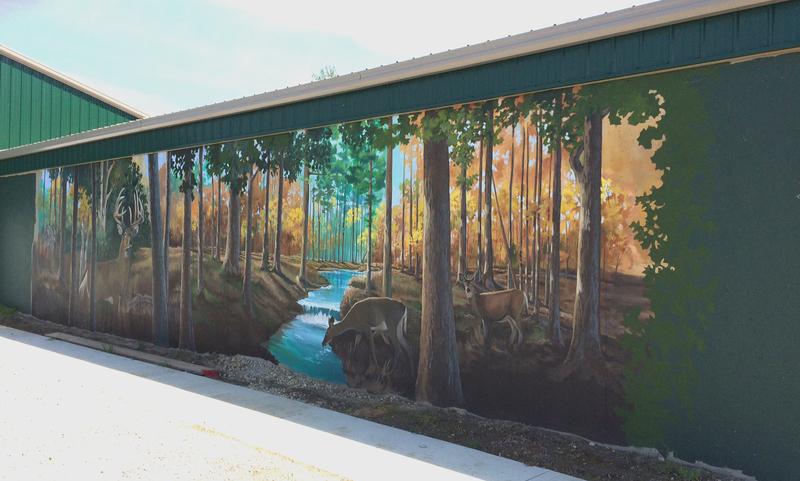 Many photos will be taken of this art with Hannibal residents and tourists. 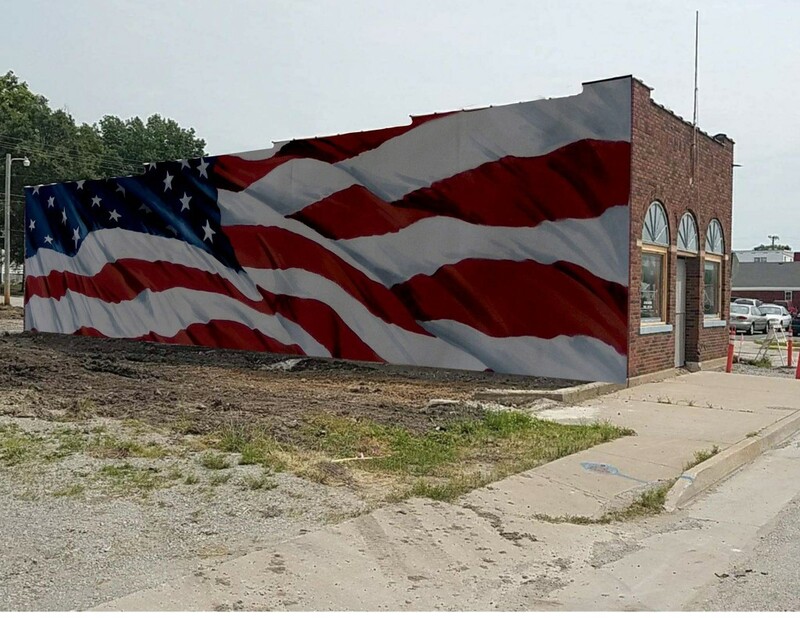 It will now always be known as the “Flag Building.” Happy Birthday America! New American Flag Mural to be Created by July 4th! One of the interesting things about this business is that you never know where the next phone call will take you. This was the case when I was contacted via Facebook from a man in Hannibal, MO. He inquired about a bid. 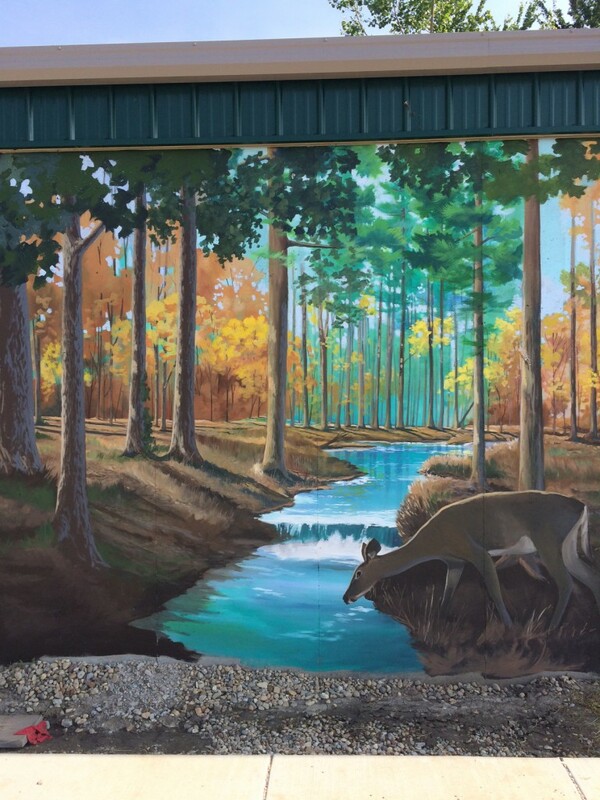 He then called me to say he actually had three buildings in mind he would like murals created. 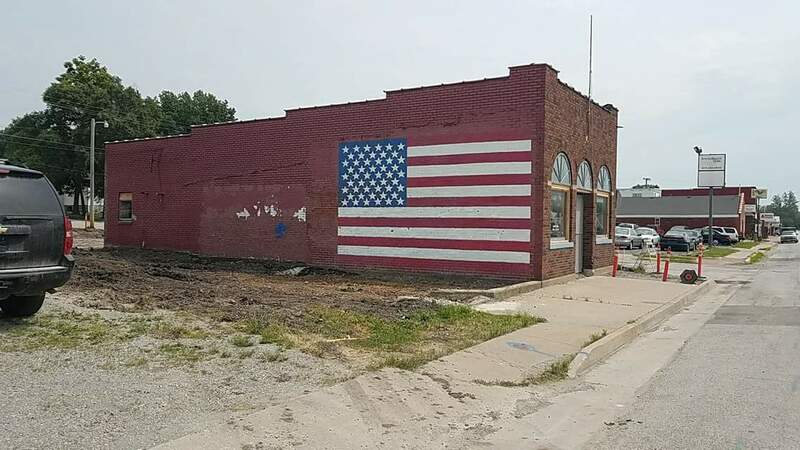 One of which was a sixty foot wide brick building with an American flag painted on it. The design was simple but heartfelt. 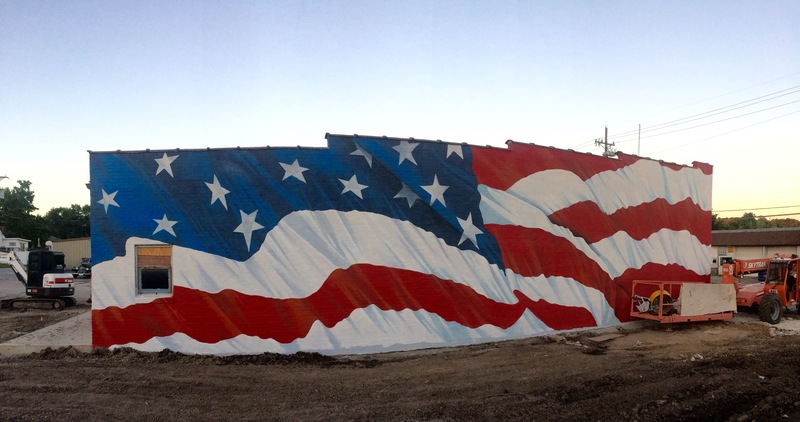 It had been painted right after 9/11. 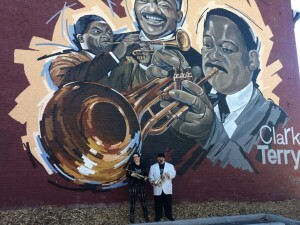 The art had been used for many photo shoots and had become part of the community. The wall had fallen to disrepair and was in bad need of tuckpointing. 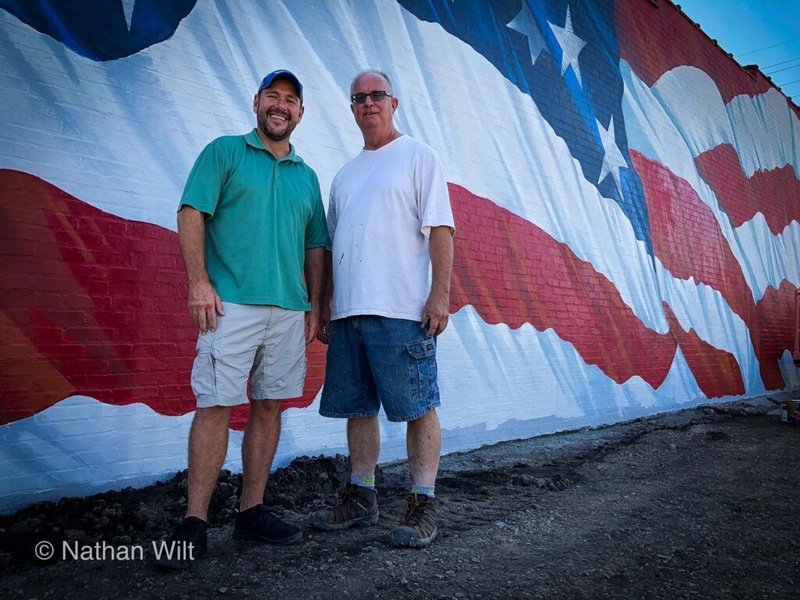 He originally wanted it to be the second wall we tackled but I suggested to him that if we were going to paint a new and improved flag mural, it would be nice to do by Independence Day. He agreed. He also got a crew of masons on it the following day. They are now working feverishly in this heat to complete the work and get it ready for my part. I wanted to give the neighborhood an even better flag to view on a daily basis. 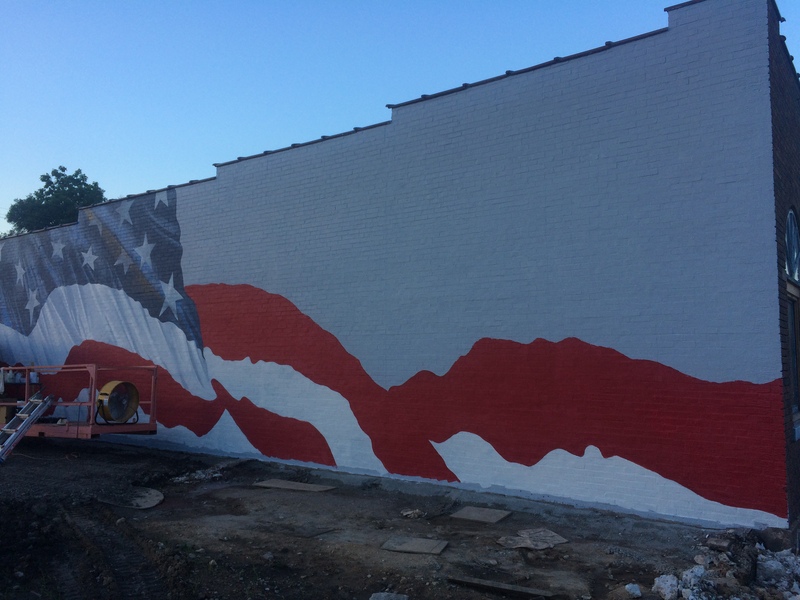 We decided to make it an edge to edge painting and add the waving flag element to add some life. That is the plan. I expect to begin June 27th and hope to be completed by the fourth. 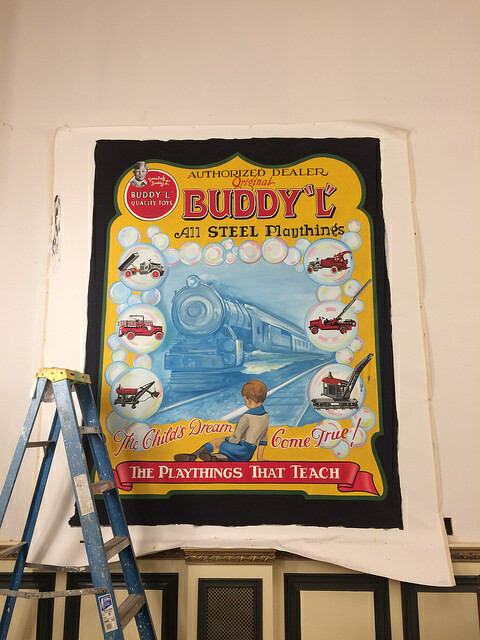 Buddy “L” Poster Gets A Re-do! 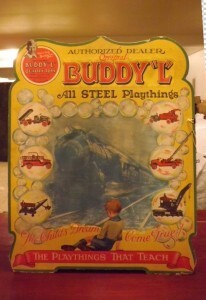 A long time customer of mine who happens to be one of the biggest collectors of original Buddy “L” metal toys, acquired the last known point of purchase toy display. 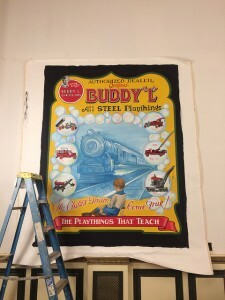 While the original is only about 18″ x 24″ he desired a painted replica of the art in larger scale. Thats where I come in. I created on canvas a”new” Buddy poster. Mine is about 5′ x 7′. This new art will now be hung on the front facade of his toy store. 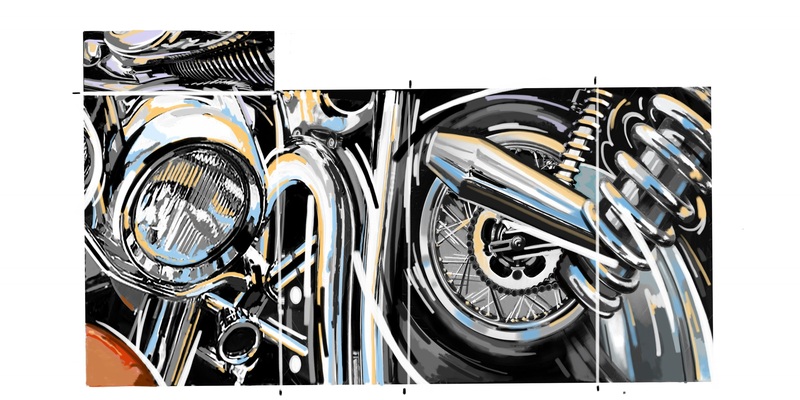 Many cities around the midwest have a public art program for their traffic signal boxes. St. Joseph, Missouri announces a call for entries regarding these projects each year. This year’s call came through loud and clear. Here is my submission. A template for all sides of the box are supplied and the artist needs to design accordingly. One goal of these box designs are to reduce the temptation of graffiti or tagging. So the design needs to be complete and busy with few open areas for tagging. 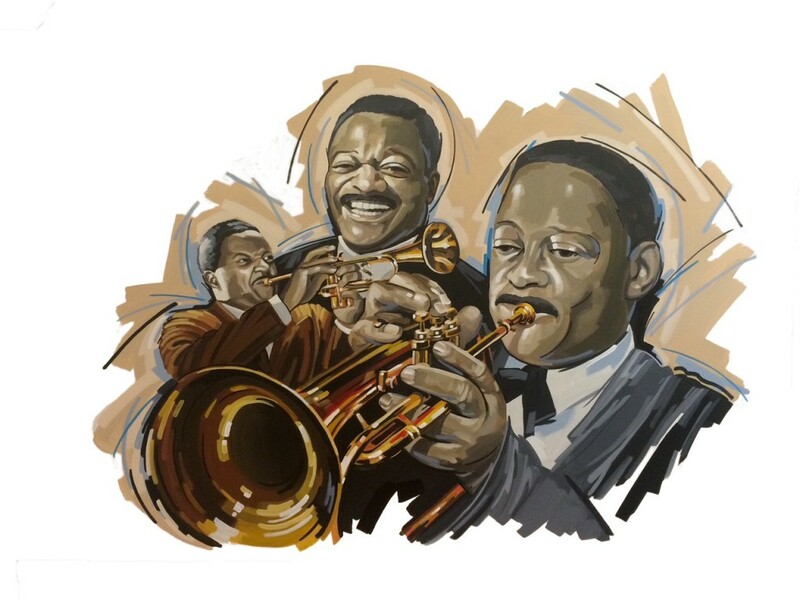 Clark Terry Original Painting now Available! I usually don’t release any of my original paintings except for private commissions, of course. But as I see this painting sitting lonely in the studio I feel I must pass it on. Too many people have shown an appreciation and admiration for Clark and this project for it to sit undisplayed. 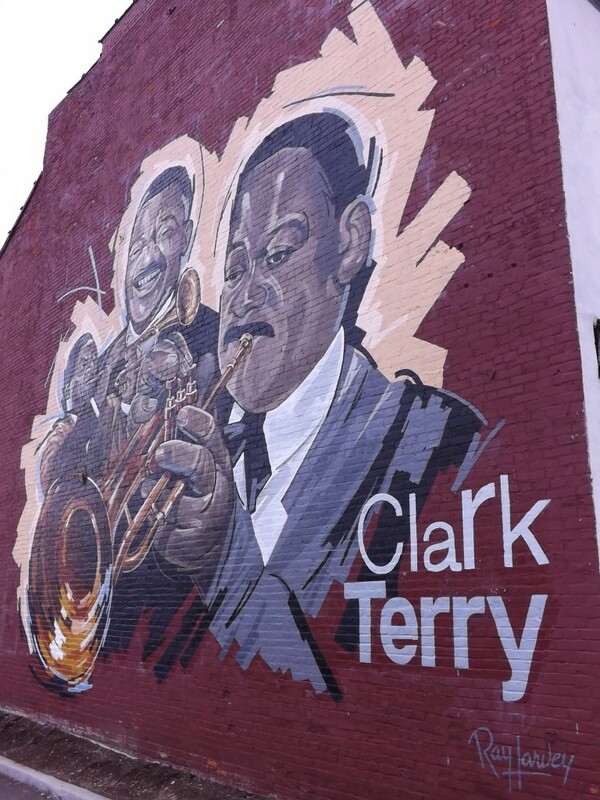 This specific original painting was the preliminary art used in the creation of the 50′ Clark Terry mural on Broadway in South St. Louis. 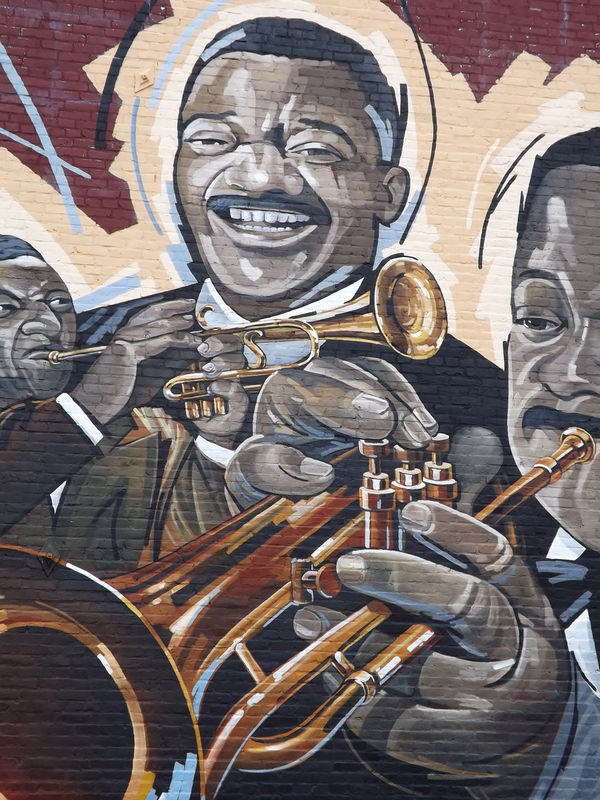 I was commissioned by the Carondelet Community Association to design and implement the mural as the eighth in their Murals on Broadway series. Clark Terry was born and lived only a few blocks from the mural site. 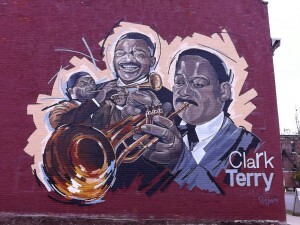 As far as we know it is the only existing mural of Clark Terry. 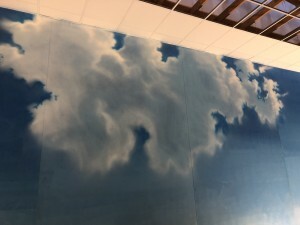 In the mural process, this smaller 24″ x 36″ painting was created as the model for the larger art. The painting is acrylic on canvas. It has now been professionally framed and is ready to display. The price is $2,400 and is ready to ship. PayPal and plastic is available for checkout. Anyone interested can contact me at 314-603-5657 or rayharveyart@gmail.com. There was no way for me to know in May that this summers painting season was to be as hot and wet as it turned out. Sunset Hills, Swiss and Aflton in Missouri. The season is not quite over yet so more may be added. Meet me and See My World of Large-Scale Public Art August 9th! The Illustrator chapter of the St. Louis Artists’ Guild has invited me to present the evening of August ninth at 7:30 pm.Join me at 12 Jackson Ave. @ Forsyth Ave in Clayton. 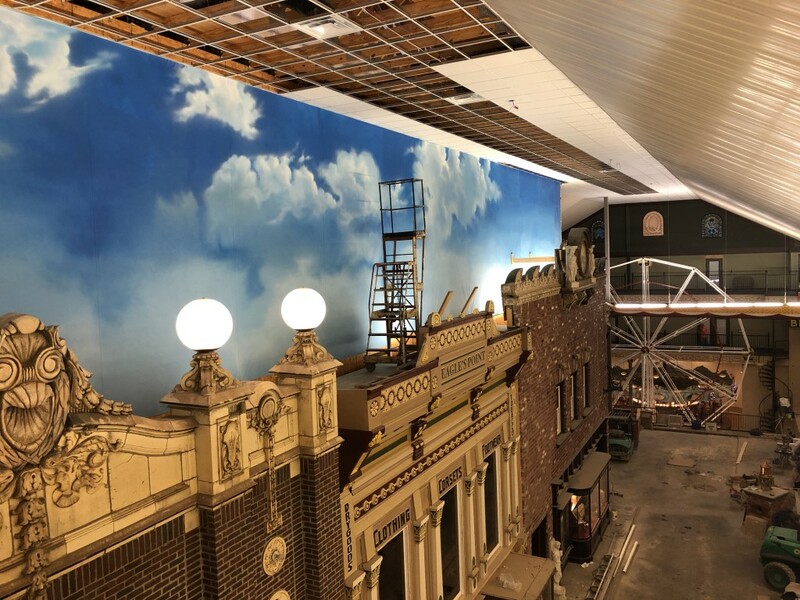 Its been difficult to boil down thirty years of work and over 400 murals to display in an hour but I did it. If you follow me on Facebook you see the progress of my latest art but you will see many older pieces that have been under exposed including residential work. Questions and discussion are encouraged. Hope to see you there! This Spring not only brought warmer weather but the first large project of the season. 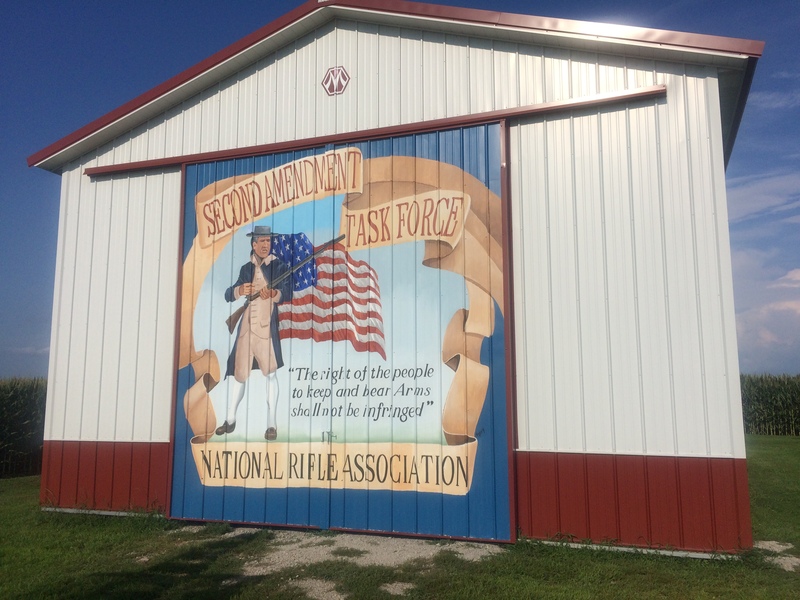 A new client, Locked and Loaded, a new shooting range and weapon store in Pana, Illinois gave me a call. They wanted a 60′ wide scene depicting a early autumn forest seen. 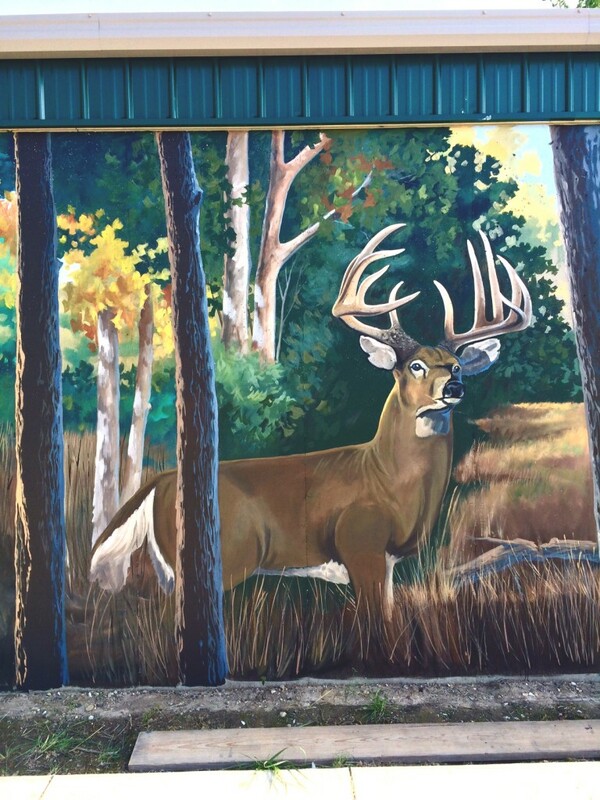 They only requested a few deer but one needed to be a massive buck! The completed scene only took eight days to paint but that was spread out over three weeks due to rain. But now, its complete. It is viewed by every car passing on Hwy 16. Clark Terry Mural Now Complete on Broadway! It took a call for entries, a resume and portfolio review, a sample design, a painting and finally a judged presentation. Then I got the call, I was chosen. 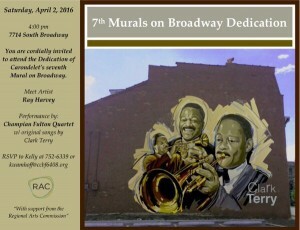 The Carondelet Community Betterment Federation had selected my design for the seventh “Mural on Broadway.” With their sites set on ten total murals the tribute design of Jazz Trumpeter Clark Terry would forever grace the streets of South St. Louis on South broadway. 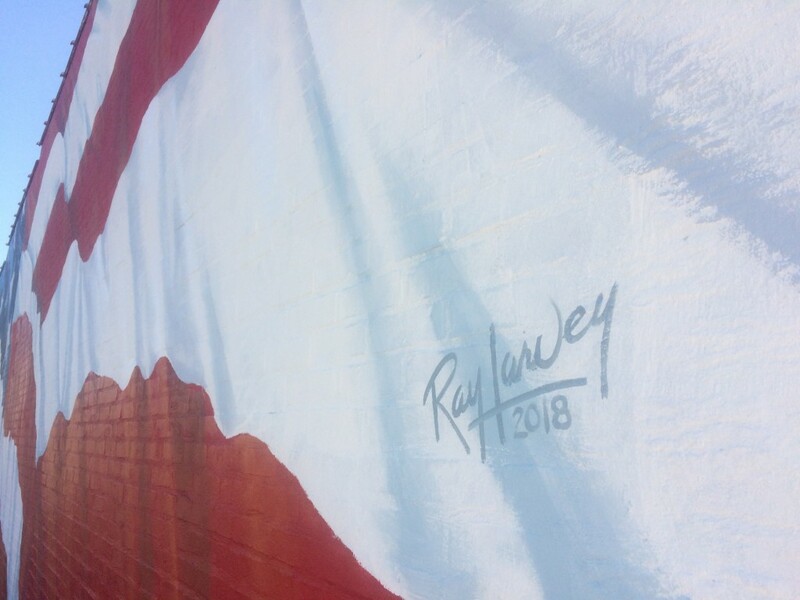 With Mr. Terry’s passing in February of this year, it seemed a natural selection to immortalize the man in the neighborhood where he was born and lived. 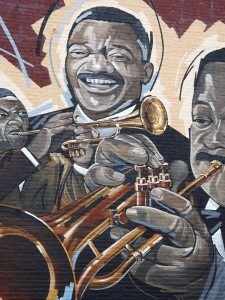 The mural is only a short walk from where he lived before his trumpet led him around the world. A self-taught musician who was inspired by all he heard on those St. Louis streets, created his own sound that led Quincy Jones to describe him as the best trumpeter ever. 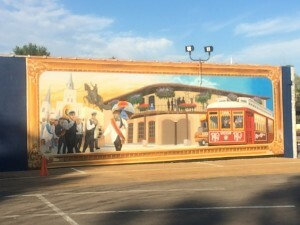 The entire mural took two weeks to complete. 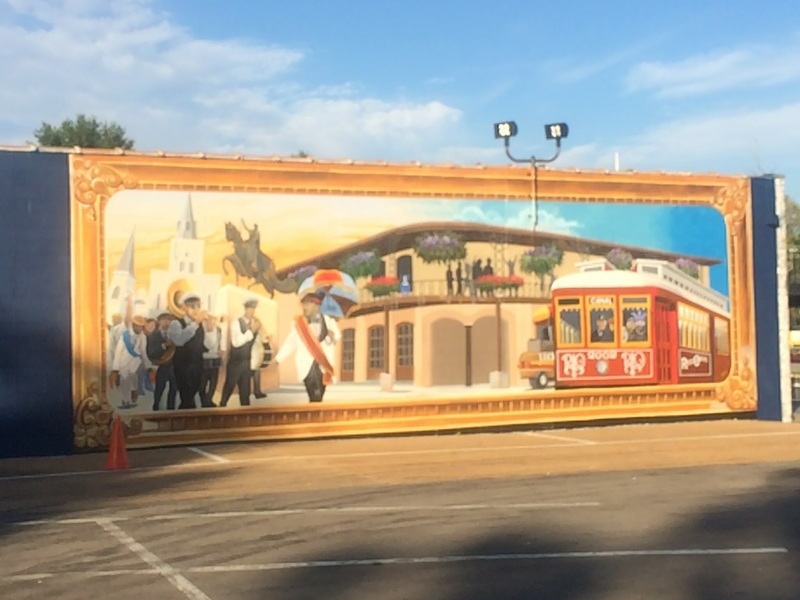 It is roughly 24′ tall and 28′ wide. It is painted on the side of an empty commercial building. 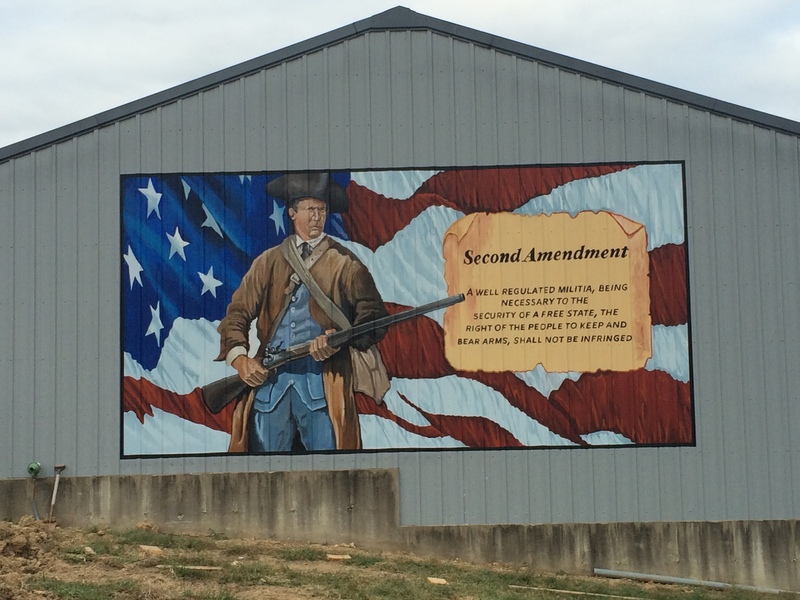 A dedication ceremony is being planned for early 2016. 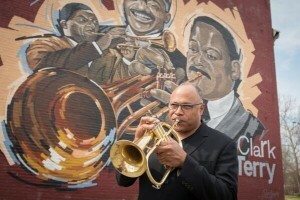 Mr. Clark’s widow, family and some national jazz musicians have been invited.